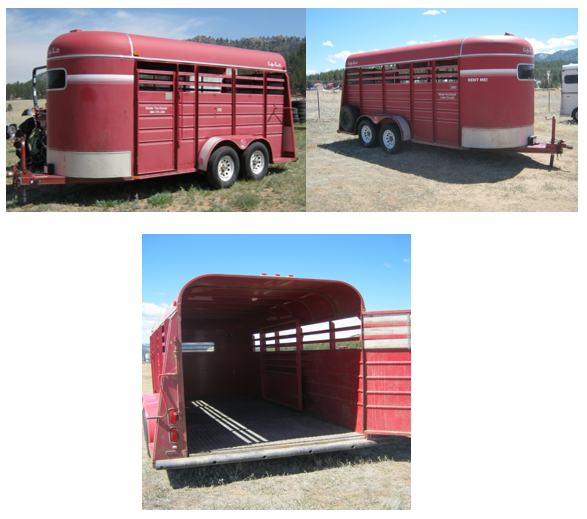 16’ Red Stock Trailer – This is a bumper pull trailer with a wood floor and rubber mats. It has a side escape door and one interior gate located toward the front section of the trailer. The front section has a saddle rack which is removable and bridle hooks. It measures 16’L x 6’8″W x 6’6”T with a single back rear door. It comes with electric brakes, spare tire, 2 5/16 ” coupler and 7 way plug.